So what is “brisket”? We get that question all the time at the bbq shop. Brisket is a cut of meat from a cow that is from the breast or lower chest area. 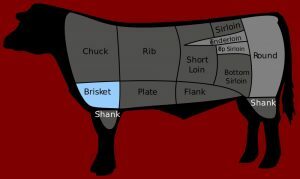 Beef brisket is considered a “primal cut” although you will get a different classification outside the US sometimes. Beef brisket can be eaten alone or on a sandwich. One of the ways people ruin a beef brisket is they trim ALL of the fat off the top of the brisket. A good BBQ caterer looks at the cut of meat, looks at the density and evaluates how much of the “fat cap” to cut off of the top of the brisket. Some of that fat is needed to ensure the brisket does not dry out. Great bbq caterers understand this and more importantly understand how the slow smoking process effects the brisket. If you are going to have an event catered by a bbq caterer. Make sure you try out their food BEFORE you order. At the very least look online to see if they have any good reviews. People will review good beef brisket. They will also be very vocal if that beef brisket is not good. Give us a call, or email if you have any questions around ordering beef brisket when engaging a bbq caterer.